The National Textile Museum is a historical center in Kuala Lumpur, Malaysia. 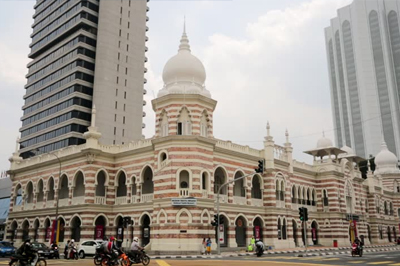 Composed by Arthur Benison Hubback in an Indo-Saracenic Revival design, the building was initially finished in 1905 to house the home office for the Federated Malay States Railways. After the FMSR moved to the Railway Administration Building in 1917, the building was given to the Selangor Public Works division, and has along these lines housed different government and business tenants, including Selangor Water Department, Malaysian Central Bank, Agricultural Bank of Malaysia, Malaysian Craft and the High Court, before being changed over for use as the National Textile Museum and opened to general society on 9 January 2010. It was gazetted as a verifiable working in 1983. The gallery is available inside strolling separation south west of Masjid Jamek LRT Station of RapidKL. The Pohon Budi Gallery showcases the causes of materials from the pre-notable times and also its development through exchange. Additionally showed are the apparatuses, materials and customary procedures of material making through the procedures of weaving, weaving, batik-production, gold weaving, sewing and beading work with specific spotlight on the nation's dominating materials, for example, the songket (a silk sarong with brilliant string woven into it), pua kumbu (a conventional designed multi-shaded stately cotton fabric utilized by the Iban as a part of Sarawak), telepuk (a fine cotton or silk fabric with engraved flower themes utilizing gold leaf or tidy), tekatan (a gold weaving made by sewing gold string to make a raised alleviation on velvets), keringkam (the conventional weaving of Sarawak's Malays regularly found on ladies' headscarves), linangkit (carefully assembled improving weaving embellishing the knee-length skirts of the Lotud individuals), kain pis (a luxuriously weaved one – meter bit of two confronting bits of material worn by the Rungus/Kadazandusun bunch as head-rigging), enhancing dabs and batik. Pelangi Gallery symbolizes the brilliant rainbow strips, which can be identified with Malaysia's diverse ethnic gatherings who are rich with their individual material fortunes. This display shows a portion of the chose legacy accumulations, for example, the distinctive sorts of batiks and their development throughout the years, the gathering of the Chinese people group, and those of the Baba and Nyonya, which are rich with their utilization of silk and gold strings and beadings, and the bountifully fine and differed themes of ethnic Sarawakian and Sabahan material accumulations. The Teluk Berantai Gallery displays the extravagance, artfulness and excellence of the Malay legacy accumulations, for example, tekatan (gold weaving made by sewing gold string to make a raised alleviation on velvet), kelingkan (a weaving appliqué'), kain tenun (woven fabric) kain limar (a smock like piece made of silk and worn over the kain songket), kain limar songket tenggarung (limar material with vigorously complemented gold string), kain telepuk (a fine cotton or silk fabric engraved more often than not with botanical themes utilizing gold leaves or gold dust), kain berayat (scripted material), and different ensembles. The Ratna Sari Gallery displays gems things and individual enhancements of the different ethnic gatherings in Malaysia made of gold, silver, copper, dabs and plants, which are intended to be worn on the different parts of the body, from head to the toe. Amongst them are the crown, pemeleh (dangling studs), cucuk sanggul (fastener), dokoh (neckband with a substantial curved pendant), pending (huge midriff clasp generally made of silver), gelang tangan (arm ornament), caping (purity plate) gelang kaki (anklet) and different others.